If you're planning a vacation to (or from) Long Island, the first place to start is getting there, and fortunately, there are seven airports to choose from when booking flights into New York City's neighboring island. Not only are there several Long Island-based airports, but there are also New York City and New Jersey airports within driving distance. Depending on the day you choose to travel, the price of flights can vary per location, so be sure to check flights arriving at each of these before you book your trip. Some of these airports also offer a few different ways to fly, including private helicopter tours of the island, so if you're looking for a bit more adventure for your trip, check out some of these exclusive offers by visiting the airports' websites. Long Island is also home to a number of smaller, private airports, which you can explore here. Located in Shirley, in Suffolk County, Brookhaven Calabro Airport is operated by the Town of Brookhaven’s Division of General Aviation. Although this airport isn't really for commercial travel, it does have more than 300 aircraft based here. Special services offered at Brookhaven Calabro include helicopter tours of Long Island by East End Helicopter and chartered private flights from some of the aircraft stationed at the airport. One of the best ways to access the Hamptons, a popular tourist destination especially for wealthier travelers, is to book a charter flight into the East Hampton Airport in Wainscott. 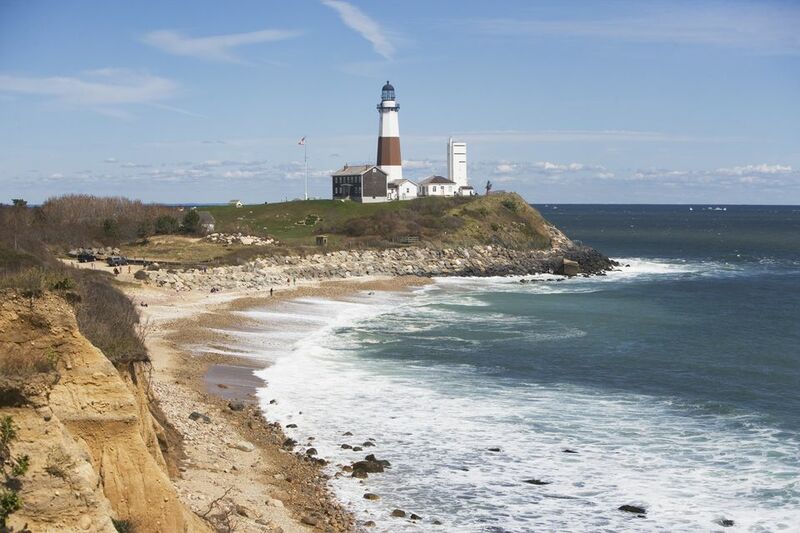 This airport, owned and operated by the Town of East Hampton, offers chartered flights on everything from helicopters to large private jets, but the only destinations you can reach from it are within New Jersey and New York state. MacArthur Airport is owned and operated by the Town of Islip in Suffolk County and is sometimes referred to locally as Islip Airport. But it is located in Ronkonkoma. Unlike East Hampton and Brookhaven Calabro, though, MacArthur offers commercial flights to destinations outside of the tri-state area. Southwest Airlines offers flights serving Baltimore, Fort Lauderdale, Orlando, Tampa, and West Palm Beach, while American offers daily flights to Philadelphia, and Frontier offers nonstop service to Fort Myers, Miami, Orlando, Tampa, West Palm Beach, Atlanta, Charlotte, Chicago, Detroit, Minneapolis-St. Paul, and New Orleans. This airport in Farmingdale, Suffolk County, serves both Nassau and Suffolk counties. Billing itself as Long Island’s Executive Airport, Republic Airport serves a number of charter flight providers, such as ​Talon Air, Ventura Air Services and Sundance Aviation, as well as a number of casino and helicopter charter services. John F. Kennedy International Airport is located in Queens—New York City’s largest borough—and is the regional hub for national and international flights. Long Island visitors and residents can hire a taxi to the airport or take the Long Island Rail Road (LIRR) to the Jamaica station, where they connect to the MTA’s AirTrain straight to terminals at JFK. With services to most places around the world, JFK Airport is the biggest and closest airport to Long Island. LaGuardia Airport, also located in Queens, offers mostly domestic flights but also has carriers that fly to Canada and parts of the Caribbean. Significantly smaller and less busy than JFK, LaGuardia is a great airport for making domestic trips into and out of Long Island and will often be the cheapest option for booking domestic travel to New York City in general. Although possible with a bus-to-subway-to-LIRR transfer, getting to Long Island from La Guardia is much easier with a car or taxi, so plan this extra expense in your budget, especially if you're traveling with a lot of luggage. Located in New Jersey, Newark Airport’s carriers include Air Canada, American Airlines, and SAS, as well as a variety of other major carriers. There are a number of ways for Long Islanders to reach the airport, but taking the LIRR to Penn Station and then the airport-bound New Jersey Transit train from the same station is one good solution. Still, since this is the furthermost airport from Long Island—and because cabs charge you an extra toll to get from New Jersey to Manhattan, then from Manhattan to Queens—this airport should be the last option you pick if you want to head straight to Long Island.